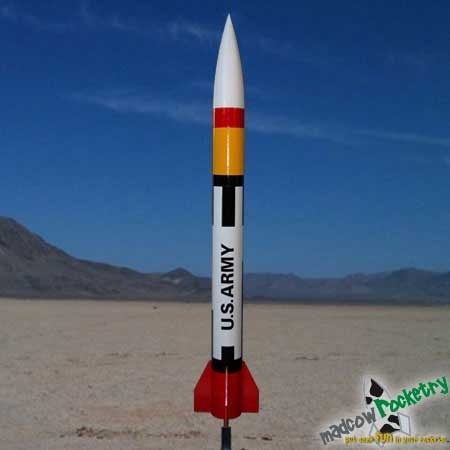 The Madcow Rocketry 2.6" diameter Patriot Missile is a mid-power to HPR model in every aspect. You'll find that it is the perfect rocket if you'd like to get your Level-1 High-Power Certification because it is very robust to handle the stresses of high power flight and it can also be launched on G motors. The kit comes with fiberglass tubes, fins, bulkplates and nose cone and nylon shock cord. The decal is not included. CG: 20" from the nose tip. This is an advanced kit. You may need to adjust CG and either friction-fit your motor or use the retainer. Epoxy can cause an allergic reaction in some people. Adult supervision and wearing rubber gloves is recommended when working with epoxy. You may need to sand the inside of the fiberglass nose cone. Wear a particle mask to avoid breathing in the fiberglass dust. This Patriot kit is a bigger rocket, which requires extra safety precautions when flown. Patience and acquired flying skills to know when NOT to fly are just as important as quality construction techniques. Since this is an advanced kit, we expect you to have launch equipment and experience building and launching mid-power rockets, therefore we do not provide the list of all required tools and materials for this rocket kit. Below are just several items you may need as well as links to motors and paint.